What’s In The Kids’ Stockings? Today’s gifts are exactly what the title implies – choice picks that are usually relatively well-priced (I typically angle for $25 or less) so you can ensure your little ones’ stockings are stuffed without breaking the bank. Assuming children still actually use pencils (and therefore erasers), this set of five pint-sized erasers is too cool for school. 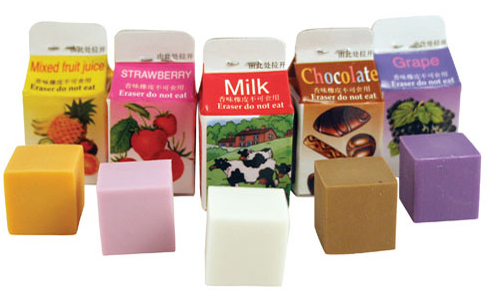 Plus, it’s also kind of a crazy good value – consider splitting up the little cartons amongst multiple kids for more bang for your buck. Kids and digging in the dirt go together well like…these fun-shaped straws and your child’s favourite drink. Designed to emulate gummy worms, these fun straws are made from squirmy silicon for a unique way to ‘play’ with your food. I have the adult version of this journal and I love it. Each day you’re given a question. You can start on whatever day you receive the journal on – but you’ll answer that same question on that same calendar date for several years in a row. This kid-friendly edition is a cool bedtime ritual that’ll help you keep tabs on the amazing progress your little one is making. It’s not talking to yourself if you’ve got characters tattooed on your fingers, right? 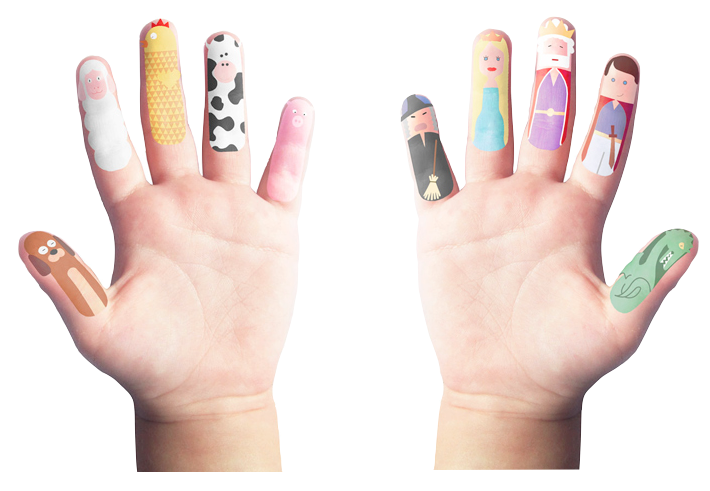 These fun, temporary tattoos put story time right into your child’s hands. Available in Farm, Safari, Fairytale and Monster collections. My husband laments that LEGO doesn’t encourage creativity the way it once used to – but the fact this tiny box actually contains 3 toys in 1 impresses me. Build a helicopter, speedboat, or old-fashioned biplane and watch your kid’s imagination soar. It’s practically scientific fact that children love to dunk their sandwich cookies in milk. However, when you think about where those grubby paws have been, you may wince at the idea of them tainting both their snacks and their milk. The Dipr is an innovative ‘spoon’ that’s specifically designed to hook around your favourite cookies for easy dunking and devouring. Available in five colours, it’s a cute treat when accompanied by a bag of limited edition holiday cookies. As if finding that bespectacled, stripes-wearing man wasn’t hard enough! 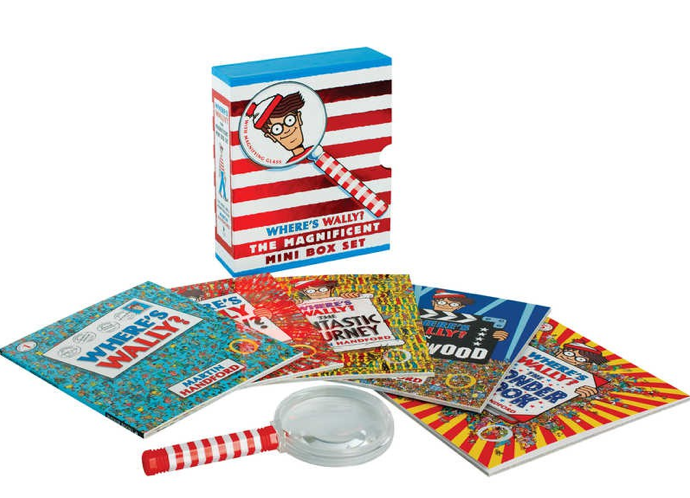 This petite gift set includes five Where’s Waldo? books in miniature form, along with a striped magnifying glass you have some chance of spotting the elusive globetrotter. A cool throwback pick that kids today will still get a kick out of. The latest Disney animated film Frozen has quickly won over young fans and old critics alike. 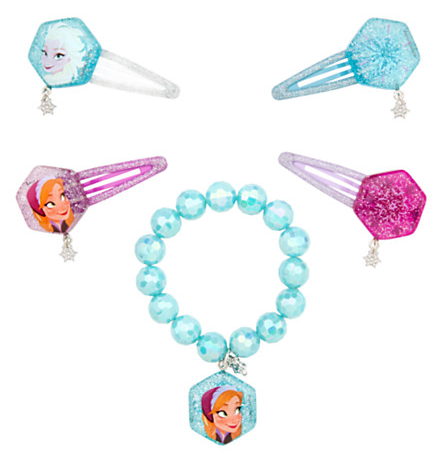 Treat your little would-be princess to a bit of ‘ice’ in the form of this glittering teal bracelet and set of wintery hair clips featuring the film’s royal heroines, Anna and Elsa. You’ll never know if you’ve got a budding Picasso on your hands unless you give them the tools to express their creativity. 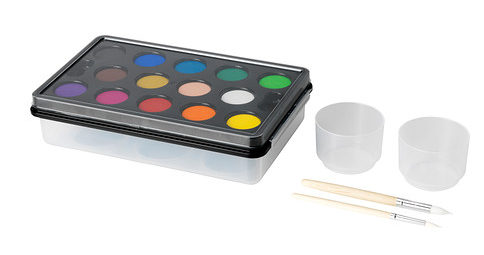 This cute paint set includes a rainbow of colours, two brushes, and two water cups for your little ones to concoct their first (or fiftieth) creations. How’s this for motivation to learn how to tie up your shoes? 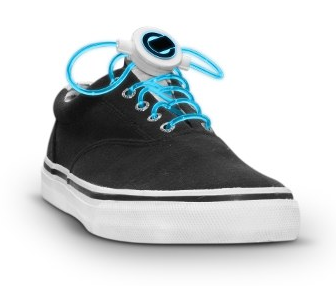 These fiber optic shoelaces have three different settings (on, flash, and double flash) for an update on those light-up shoes that have been oh-so-trendy over the last few years. 1) Leave me a comment by January 10th telling me which of these kid-friendly stocking stuffers you’d most like to surprise a little one with (or you know, get yourself, even if you aren’t a kid). 2) Entries are limited to one per person / per email address / per household (or more if you score bonus entries). A random draw will be conducted on or around January 11th to select the winners, who will have 48 hours to respond before another winner is chosen in their place. 3) Entries are limited to Canadians that have reached the age of majority in their province. Quebec is not eligible for this promotion. 4) Bonus Entry: The Dipr has already built up over 1,000 loyal fans on Facebook. Join ’em, leave a comment about why you’d like to try The Dipr for yourself, earn a bonus entry into the draw when you link back to that comment below. ← What’s In The Teens’ Stockings? I like the laser laces for my kid. 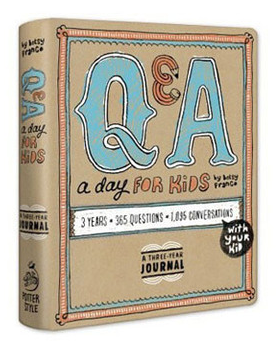 I really like this: “Q&A A Day for Kids.” Such a neat idea. I would gift the Laser Laces to my friend’s little man. My boys would most like to see the Lego Creator Red Thunder in their stockings, but I really am attracted to the milk carton erasers!! Waldo has been a long-time favourite at our house, so I would pick Where’s Waldo? The Magnificent Mini Box Set. Love the kids Q&A book too! The laser laces look awesome! I’d be most likely to surprise my son with the LEGO Creator Red Thunder. He loves Lego. The scented erasers are fun for my youngest daughter! Both of my grandkids would love the Laser Laces. 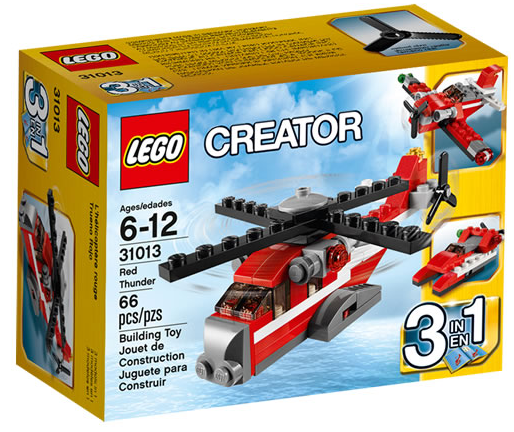 I would love to gift my nephew the LEGO Creator Red Thunder! I like the laser laces. My son would LOVE the Where’s Waldo gift box set, he loves books where you have to find stuff! 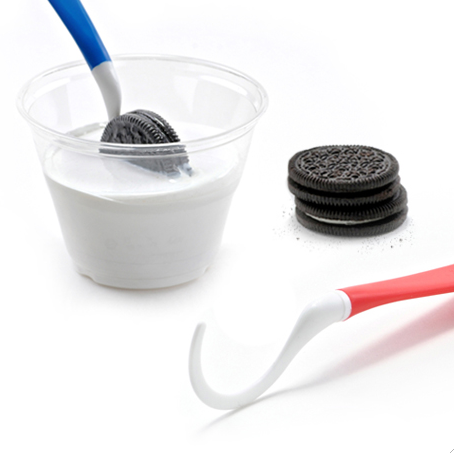 ao Oreo dunking device..what next!! The scented erasers are super cute. My son would love the Where’s Waldo Mini Box set. My grandchildren would be thrilled with the Where’s Waldo set! My girls would love the Fred & Friends Slinky Drinks, they love straws. The Fred Slinky Drinks look like fun! We all want the dipr set so we can dunk our Oreos. The Q&A a Day book- I have a list of questions I ask my son each year to see how his answers change but this would make it fun to do everyday and see the progress, love this! 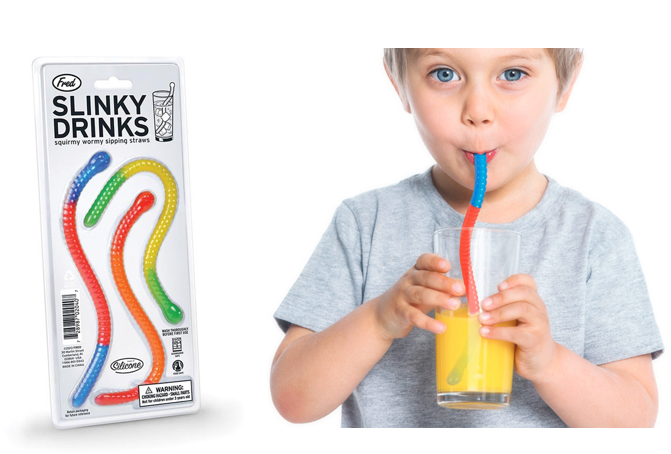 My nephew would love the slinky drinks straws! The Q&A A Day for Kids book! The laser laces would be a hit with my great-nephew. I know that my daughter would love the Frozen Anna and Elsa Bracelet and Hair Clips Set and my son would like the LEGO Creator Red Thunder! Laser Laces are so cool. My little grand niece would love them.